Family is precious. I lost my grandfather to lung cancer. My uncle beat prostate cancer! 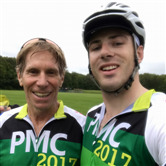 Founded in 1980, the Pan-Mass Challenge (PMC) is an annual bike-a-thon that today raises more money for charity than any other single event in the country. 100% of every rider raised dollar goes directly to the Dana-Farber Cancer Institute. After moving to Boston and learning about the PMC, it was natural to pair a passion for cycling with a leading charge to beat cancer. As a member of the Patriots Platelet Pedalers, 100% of the money the team raises is earmarked for Dr. Ken Anderson, the Kraft Family Professor of Medicine at Harvard Medical School and Dana-Farber Cancer Institute, to support his multiple myeloma research and development of novel therapies. I am exctied for my third PMC and appreciate all donations to achieve my fundraising goal.